A cute yellow dragon. He was purchased at least 3 years ago. Last year he went missing. He was found again deflated and somewhat dirty in a cellar closet. 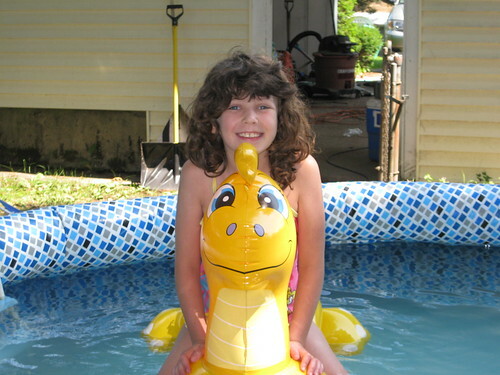 A little girl is happy now that her yellow dragon was found again! Such a sweet yellow dragon and your little one seems so happy at play! The yellow dragon and of course your daughter are very cute together. 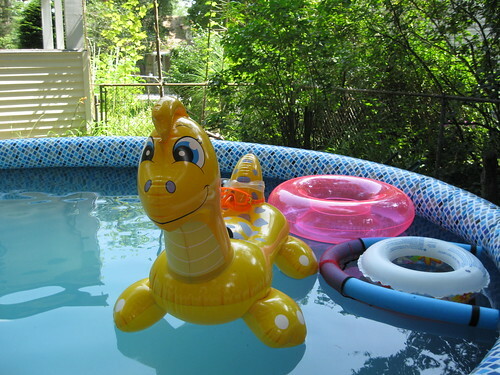 It is always good to have a dragon (especially a yellow one) guarding your pool! Your daughter has a beautiful smile! I am glad he was found! Cute pictures! Aww I miss floating on those ! oh I love this!! Your daughter is lovely and I love the yellow dragon. My 2 youngest grandsons would love it too!! What a fun toy...he looks brand new despite his age. This yellow dragon looks like the one in Waterhorse! wow.. ilike it..it's cool..Happy MYM. Geez it seems like she is just getting way older looking all the sudden. They grow up so fast. Your little girl is adorable and has a delightful smile! What a cute yellow dragon! She's a cutie and so is the dragon!